The Little Green Lice Guard system is comprised of 3 non-toxic products that are clinically proven to help prevent head lice infestation. Little Green Lice Guard Shampoo, 8 oz. Shampoo that gently cleans the hair and effectively helps to repel head lice. Little Green Lice Guard Detangler, 8 oz. Conditioning hair detangler that nourishes the hair and effectively helps to repel head lice. Little Green Lice Guard Styling Gel, 4.2 oz. Styling gel that effectively helps to repel head lice. This gel is perfect to create structured styles (like slicked back, ponytails, buns, and braids for girls or spikes for boys) that “seal” the hair and make it difficult for lice to adhere to. 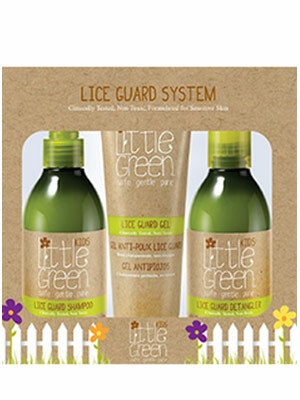 All of the products in the Little Green Lice Guard collection are formulated with a proprietary blend of natural Tea Tree, Neem, Rosemary, Peppermint, Lavender, and Eucalyptus oils to effectively help repel head lice. They are non toxic and specially formulated for sensitive skin. These products are EFFECTIVE, yet gentle enough for daily use. For maximum results layer all the products in the Little Green Lice Guard system. Apply shampoo to wet hair and gently massage into a full lather. Rinse thoroughly and repeat if desired. For maximum protection, follow with Lice Guard Detangler and Gel. Spray liberally through the layers of damp or dry hair paying special attention to part lines and hairline around neck and ears. Comb through and style as desired. For maximum protection, use in combination with Lice Guard Shampoo and Gel. Apply a small amount to hands and work through the layers of damp or dry hair with fingertips. This gel is perfect to create structured styles (like slicked back ponytails, buns, and braids for girls or spikes for boys) that “seal” the hair. For maximum protection, use in combination with Lice Guard Shampoo and Detangler. Safe for daily use.